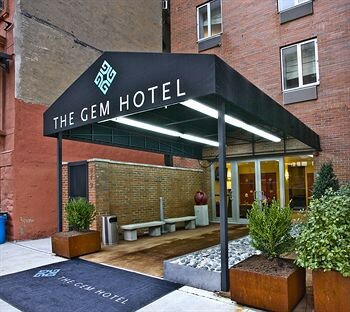 Property Location A stay at The GEM Hotel Hudson Yards, an Ascend Hotel Collection places you in the heart of New York, minutes from Jacob K. Javits Convention Center and close to Times Square. This hotel is close to Macy&apos;s and Broadway.Rooms Make yourself at home in one of the 39 air-conditioned rooms featuring microwaves. Your room comes with a pillowtop bed. Complimentary wireless Internet access is available to keep you connected. Bathrooms have hair dryers and bathrobes.Rec, Spa, Premium Amenities Make use of convenient amenities such as complimentary wireless Internet access, a television in the lobby, and tour/ticket assistance.Business, Other Amenities Featured amenities include complimentary newspapers in the lobby, dry cleaning/laundry services, and a 24-hour front desk.